Kee Safety - 26-7 - Kee Klamp Two Socket Cross, 1-1/4&quot; Dia. Kee Safety - 26-7 - Kee Klamp Two Socket Cross, 1-1/4" Dia. Kee Safety - 25-7 - Kee Klamp 90 Degree Three Socket Tee, 1-1/4" Dia. Kee Safety - 21-7 - Kee Klamp 90 Degree Two Socket Tee, 1-1/4" Dia. Kee Safety - 20-7 - Kee Klamp Side Outlet Elbow, 1-1/4" Dia. Usually paired with Type 25 to give a 90° joint between the middle rail and an intermediate upright on safety railing. The upright passes through the fitting. There are 0 questions and 4 answers for this product. Sales and Product training tips? Kee Safety - 15-7 - Kee Klamp 90 Degree Elbow, 1-1/4" Dia. Kee Safety - 15-6 - Kee Klamp 90 Degree Elbow, 1" Dia. Kee Safety - 61-7 - Kee Klamp Medium Flange, 1-1/4" Dia. Kee Safety - 61-5 - Kee Klamp Medium Flange, 3/4" Dia. Kee Safety - 10-7 - Kee Klamp Single Socket Tee, 1-1/4" Dia. Kee Safety - 10-5 - Kee Klamp Single Socket Tee, 3/4" Dia. Kee Safety - 133-B - Kee Klamp Plastic Pipe Plug, 1" Dia. Kee Safety - 133-C - Kee Klamp Plastic Pipe Plug, 1-1/4" Dia. Kee Safety - 133-D - Kee Klamp Plastic Pipe Plug, 1-1/2" Dia. Global Pipe Fitting - 90 Degree Two Socket Tee 1" Dia. Global Pipe Fitting - Crossover 1-1/2" Dia. 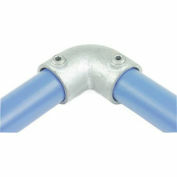 Global Pipe Fitting - Rail Flange 1-1/2" Dia. Global Pipe Fitting - Two Socket Cross 1-1/4" Dia.